Engaging Students and the Community. Natural Classroom. Cultural Immersion. Experiential Learning. 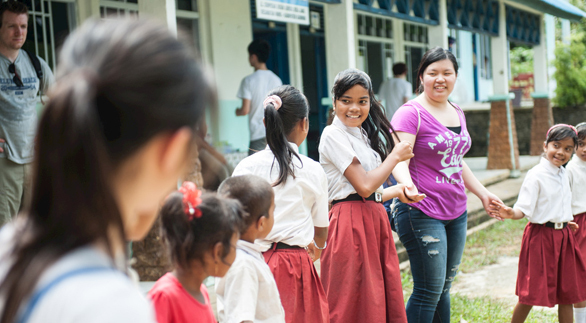 We believe in learning from experiences; therefore, at the Telunas Center, our activities are designed to benefit the group as well as nature and the surrounding communities. 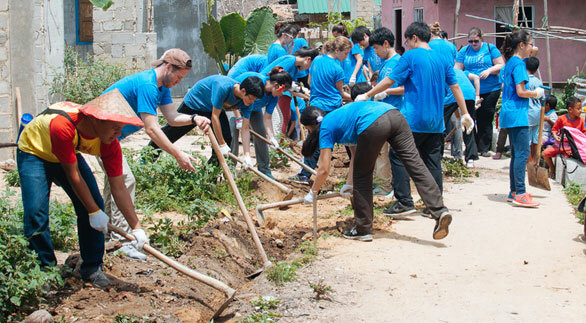 Our desire is to create a long-lasting relationship between your group and the community. Years of community development projects have fostered a positive relationship with many local villages and our growing reputation is opening up new opportunities each year. These can range from teaching English or painting a mural for a primary school, to more labor-intensive projects like building a well or concrete volleyball court for the village. Our process includes consulting with surrounding communities to determine what felt needs exist. We then try to match the best fit between our Telunas groups and the community. We have a history of working with schools to align service learning with IB Creativity, Action, Service (CAS) programme requirements and address multiple Global Issues Network (GIN) goals in a focused rural context. Telunas is a laboratory! At Telunas we believe science is about discovery and investigation. Scientific learning should be experienced, not just digested from a book. Telunas is the perfect laboratory for experiencing multiple ecosystems and getting a close-up look at local plants and animals. Located over the ocean, next to mangroves, and backed up to the jungle, Telunas offers a rich environment primed for exploration. Our team works with teachers and outside experts to develop activities and experiential learning for subjects such as astronomy, biology, zoology and physics. 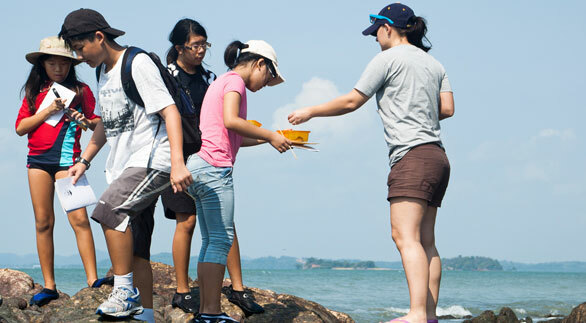 Explore nature through intertidal walks, a mangrove forest tour, or an environmental impact study. We partner with schools by providing another tool to develop students’ writing skills. At the Telunas Beach Writers’ Workshop, we challenge students to enhance their skills through real-life experiences, creative writing exercises, and gleaning wisdom from our artist in residence – Mr. Richard Tulloch (Bananas in Pajamas, Playschool). 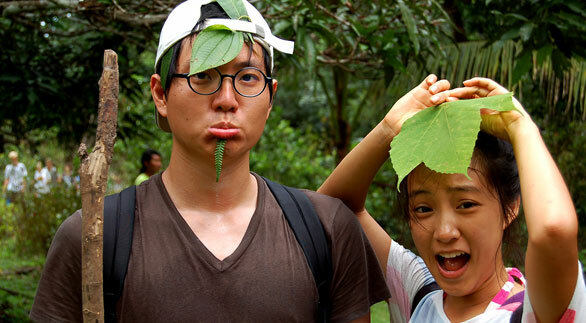 Activities such as exploring a deserted island, trekking in the jungle, swimming at a waterfall, and observing life in a local village inspire young minds. 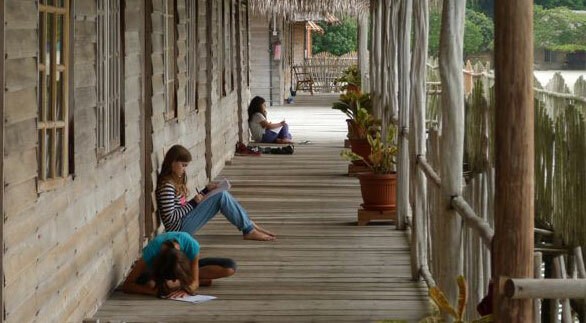 Writers’ Workshop is a great way to ignite students’ creativity as they experience Telunas Beach and the surrounding area while being coached to further develop an important skill. Read Richard’s Blog from the workshop. Telunas has a host of leadership development and team building activities that can be the trip theme or incorporated into a trip. We tailor make our trips to fit your organization’s needs. Exercises, games, stories, and activities foster better understanding among individuals about the necessary skills and ideas needed to operate on or lead a team. We have used DISC personality profiles, game elements, Low Ropes Course, JOHARI Window, decision making styles and techniques, and Cross-cultural communication seminars. Programs utilize the incredible environment of Telunas Beach to bring you an unforgettable opportunity to develop your students. Towering jungle, sandy beach, open sea, and the limits of our creativity set the stage for Telunas adventures. Our adventure programs generally involve some of the following elements: cultural immersion, jungle trekking/camping, team building, community development, high jumping, Telunas games, and more. Adventures are purpose-built in coordination with your trip leaders. Our trips are adapted to suit age and ability level of participants. Race through a series of adventurous and team-building activities prepared around our facility. 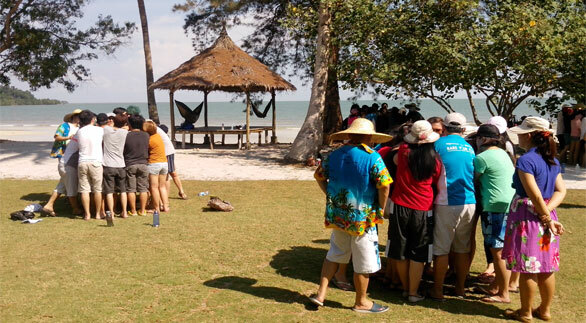 Compete in a variety of competitive traditional games designed for a fun day at Telunas Beach Resort. Backpack past a waterfall to your campsite where you’ll cook dinner and discover hammock camping under the jungle canopy.